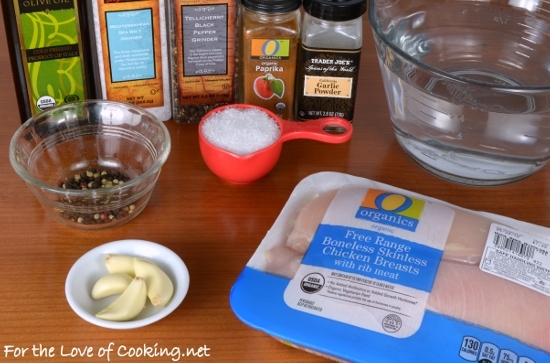 I finally did it… I brined chicken breasts. I have no idea why it took me so long to try it because it was so simple! I did a quick brine using water, salt, peppercorns, and garlic cloves. I let the chicken sit in the brine for 30 minutes before simply seasoning it. I baked it at a very high temperature for 20-25 minutes and it turned out perfectly cooked, juicy, tender, and so delicious. We all thought it was amazing. I paired this chicken with the Roasted Smashed Herb Potatoes and a garden salad for a healthy and tasty meal. I will be brining my chicken breasts from now on. I’ll be trying a brine on pork chops next! Combine the water, kosher salt, peppercorns, and garlic cloves together in a glass dish. Stir until the salt dissolves in the water. Add the chicken breasts and let it sit for 30 minutes. Preheat the oven to 450 degrees. Coat a baking dish with cooking spray. Pat the chicken dry with a paper towel then season both sides of the chicken breasts with garlic powder, paprika, sea salt, and freshly cracked pepper, to taste. 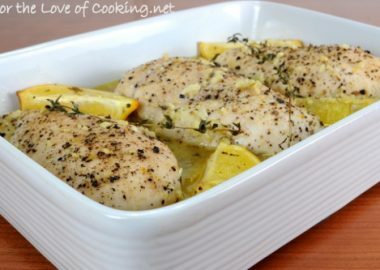 Place into the baking dish and bake for 20-25 minutes, or until the chicken is at an internal temperature of 165 degrees. Remove from the oven and let the meat rest for 5-7 minutes. Slice and serve. Enjoy. Combine the water, kosher salt, peppercorns, and garlic cloves together in a glass dish. Stir until the salt dissolves in the water. Add the chicken breasts and let it sit for 30 minutes. Pat the chicken dry with a paper towel then season both sides of the chicken breasts with garlic powder, paprika, sea salt, and freshly cracked pepper, to taste. 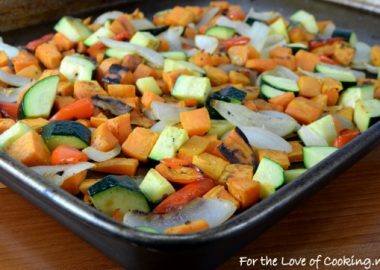 Place into the baking dish and bake for 20-25 minutes, or until the chicken is at an internal temperature of 165 degrees. Remove from the oven and let the meat rest for 5-7 minutes. Slice and serve. Enjoy. 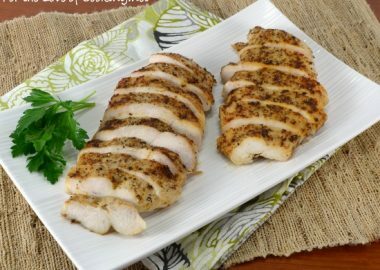 I love these chicken breast! My husband just showed me this article and luckily, I found chicken breasts in my freezer. Can’t wait to try it later today! Another great way to make the chicken taste so good! Yum! I haven’t brined anything either because it always seemed to take too long, blah blah blah. This sounds easy and not time-consuming at all – thanks – I’m going to try it!! Being the cook that you are, I don’t know why you waited either. Chicken breast and pork line really benefit from brining. Glad you gave it a try. Brining adds so much flavor, doesn’t it? 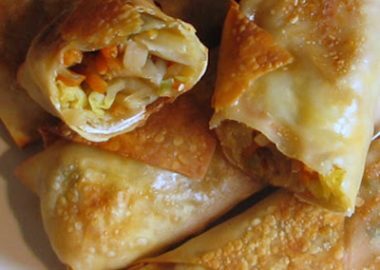 These look terrific — super dish. Thanks. I’ve taken up trisecting my frozen turkey breast, adding seasoning and broth to them and sealing them with a vacuum packager before freezing them. Then they thaw right into the seasonings, I use less salt, and the flavor is much better. I might just take up this idea and vacuum seal my chicken breast with brine, too. These look great, Pam. 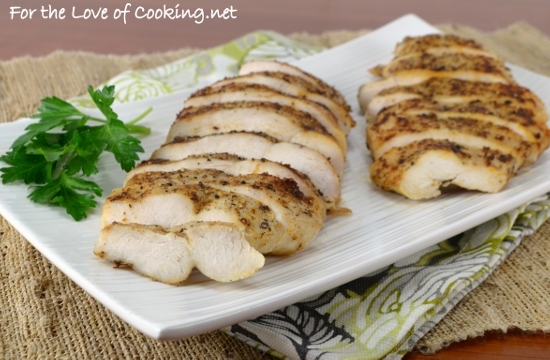 Love chicken and there are so many ways to prepare it. 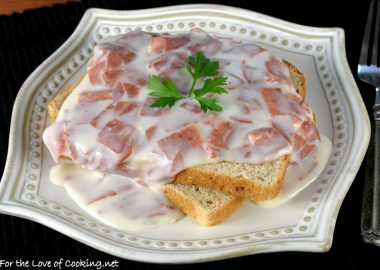 Your brine looks like one I would use – not too much salt and no sugar. I have never tried marinating the chicken in brine, I bet it must have tasted particularly great! Loved this idea of brine. Never tried this and surely next time going to follow it. Yeah for brining! I love to brine chicken, turkey and pork. 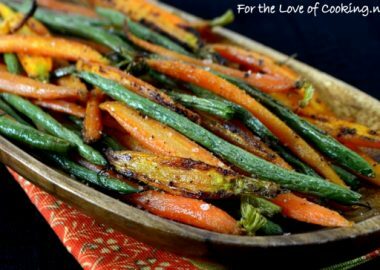 It ensures the meat will be moist and juicy, and even more important- seasoned all the way through. Depending on what I am doing with the meat, I love to add fresh herbs (rosemary, thyme, etc.). 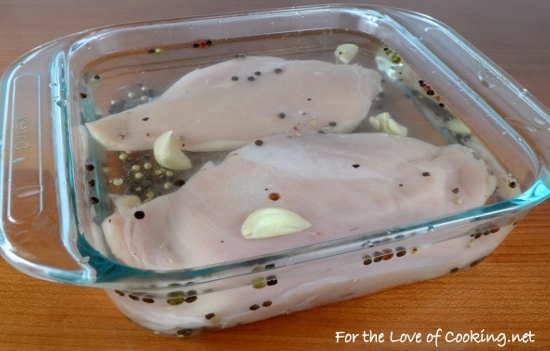 Great move on the brine, I always like to brine chicken breasts when I grill them. 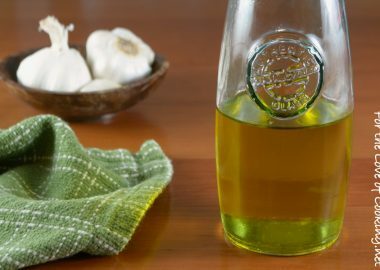 This might be obvious to most people, but since I’ve heard it said time and time again that there is no such thing as a stupid questions, here goes… when you remove the chicken from the brine, do you need to pat it dry, or do you simply pull it out of the water and add the seasonings while it is wet? Thank you for bearing with my question. Not a stupid question at all. I dabbed the chicken with paper towels after removing it from the brine then seasoned it. The spices won’t stick to the chicken if it’s wet. I hope this helps. Why not add sugar? What does this do to the taste? I’ve never added sugar to this brine so I am not sure how it would taste. If you do add it, please let me know what you thought of it. Four skinless/boneless large chicken breasts. Marinated 2 hours in the fridge. Patted dry and cooked on Green Egg to about 160F in the thickest part using a Thermapen. Couldn’t tell any difference. In fact, it seemed a bit drier than when I cooked four breasts that had skin with the bone in. Maybe it was that they were skinless/boneless. Not sold . . . yet. I have co-workers that swear by brining turkeys so I know there’s something to it. BTW – no sweetness noted at all. Thank you, Pam. I tried your recipe twice with amazing outcome both times. I was complemented on the tenderness and flavors of the chicken breasts. Considering the fact that I do not cook, I was very much trilled about this fact. 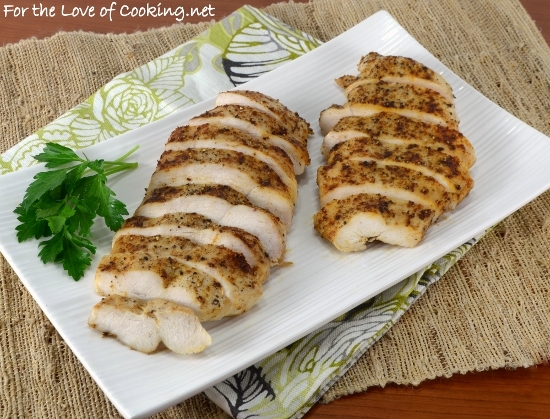 It is my favorite way of brining chicken breasts. They come out very dlicious. Thank you. With the brining being relatively short (30 minutes), do you refrigerate during that time or not? I can see logic to doing it either way, but the current general thinking seems to suggest refrigerating would be the safe recommendation. Do you refrigerate? Thomas, I leave it out on the counter when brining/marinating for 30 minutes or less, otherwise I put it in the refrigerator. Saw someone brine chicken on a cooking show so found your recipe trying it for the first time tonight. I did add 1/4 cup sugar just because on the show i know they did. My chicken breasts are bone in then pat dry brushed with olive oil and then seasoned. We will see how they turn out. Delicious- I cooked down the pan juices, added a splash of red wine, and poured it on them when serving. Highly recommend this dish! 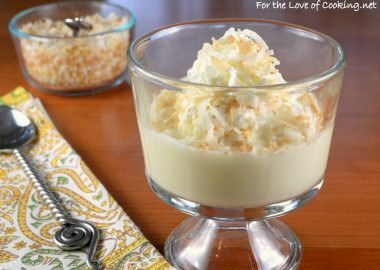 I tried this recipe — absolutely delicious! We are actually changing our Christmas menu to include this. Superb! I seriously doubt that I will ever do chicken the same old way again. Ever! Any suggestions as to how I might combine this with a lemon-pepper flavor? I would keep the brine recipe the same but season the chicken well with lemon-pepper before cooking instead of regular pepper. Let me know how it turns out. I flatten the chicken breasts to the same thickness with a mallet. 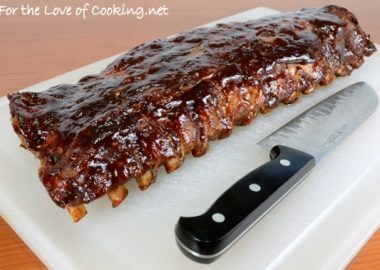 Should this be done before or after brining? Never brined before but want to try it! Sorry, I’ve been on vacation and I am just now seeing this. I brine first then flatten. 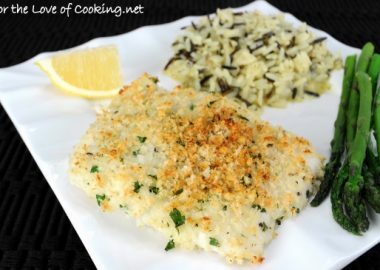 I am trying your Recipe tonight!! I am hoping for the best. Thanks so much for this Idea! I have a question. I have been brining with 1/4 cup salt and 1/4 cup of sugar for some time now. Sometimes I put them in whole and other times I halve them and then bring. have a feeling that I should brine the chicken before halving or butterflying it – it seems like the breast meat takes on too much salt if I cut first and then brine. Does this make sense? I always brine full chicken breasts then cut them later. Hi! Is it true that if you buy frozen chicken and it says @15% chicken broth and salt has been added that you DON’T need to brine? I wouldn’t want to “double brine!” Can you brine any chicken breast? I brined chicken breasts 1st time today similar, but with no peppercorns or garlic. It was amazing!!! So tender&juicy. But my recipe said 16-18 min. in 450 oven. I did cut the large breasts to make less thickness. I didnt pound it out either. Didn’t need to. When I put the meat thermo. into the breast meat, it did read 160. then after taking it out, it went up to the 165 during rest time.